Mac and PC users unite in ergonomic typing. 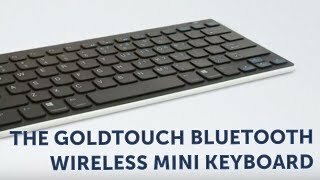 Bluetooth compatible and an ideal companion to your iPad, iPhone or tablet, the Bluetooth Wireless Mini Keyboard by Goldtouch is a positive addition to your work style. Soft-touch and shortcut keys make typing efficient and enjoyable once again.